Microsoft has announced its FY15 Q1 earnings, beating estimates with a 25 per cent year-over-year increase in revenue. Revenue generated totalled $23.20 billion and investors were cheered by an EPS of $0.54. Defying analysts' expectations of $22.02 billion in revenue and an EPS figure of $0.49 to £0.50, the positive financials are the result of sharp gains delivered by some of Microsoft's key businesses. The company's two main segments both saw growth in revenue, with its Devices and Consumer revenue up by 47 per cent to almost $11 billion and its Commercial group revenue rising 10 per cent to $12.3 billion. In the Devices and Consumer business, the company's Surface device revenue rose a whopping 127 per cent to $908 million this quarter from the $400 million this time last year. 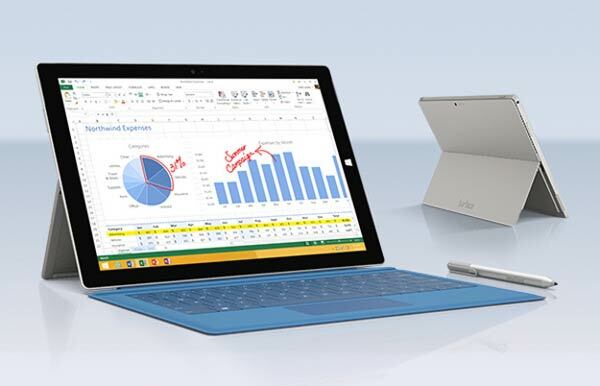 This is despite the company quietly phasing out the Surface Pro 2 from its product offering with the launch of the Surface Pro 3 in late June, reports PC World. Surface is likely to become the company's next billion dollar business and Microsoft notes that the Surface gross margin turned positive for the first time this quarter. However it didn't provide an exact break down of all the marketing and R&D costs involved. A 25 per cent sequential growth in subscribers for Office 365 Home and Personal from the fourth quarter was another highlight. Xbox console sales, which include both the Xbox One and Xbox 360, have more than doubled, reaching 2.4 million units in the quarter. Microsoft also reported its Nokia business totalling $2.6 billion in revenue, on top of $478 million of gross margin. In Commercial, sales of SQL Server, System Centre and Windows Server grew 13 per cent, whilst its cloud computing software and services including Office 365, Azure and Dynamic CRM shot up 128 per cent. Windows volume licensing revenue increased 10 per cent, the report added. Net income has decreased 14 per cent from last year's $5.24 billion to $4.5 billion, a drop which is largely related to $1.14 billion in integration and restructuring expenses related to both Microsoft's restructuring plan and layoffs announced in July. The integration of Nokia Devices and Services businesses following the $7.2 billion acquisition also impacted the net income figures. "We are innovating faster, engaging more deeply across the industry, and putting our customers at the centre of everything we do, all of which positions Microsoft for future growth," said Satya Nadella, chief executive officer of Microsoft in a statement accompanying the results. "Our teams are delivering on our core focus of reinventing productivity and creating platforms that empower every individual and organization." Net income is then 19.4% of revenue - about 2/3s that of Apple. That's because we don't pay the Apple tax! I wonder if the Surface Pro iterations are cutting into iPad sales or whether it's just enticing people who buy them and do away with cumbersome desktop/ laptop. At least here in the UK I feel that the advertising was more present/ forthcoming for the Surface Pro 3 then it's previous versions. I don't think anyone who bought a Pro 3 would feel the need to also buy a new tablet, but it's definitely a full on PC/laptop replacement and positioned that way. The Pro 3 has made enterprise portable computing buying a lot easier, I can tell you that. There aren't too many mobile usage scenarios where you can make a case for a laptop over a Pro 3. A small, light touchscreen device with a full keyboard running a full version of Windows at warp speed is absolute gold for enterprise procurement. The Pro 3 is aesthetically more pleasing than an iPad Air, if there was an i3 128GB version that was within £20 of the 128GB wifi Air it would be a compelling prospective buy. It will be interesting to see if the mythical iPad 12 incher materialises then see how prices compare. Microsoft seem on the hardware front to be doing a lot of things right.